Come Along and Meet Us at the Branch Hospitality Event!! The Scottish Branch will be holding their annual Hospitality Event on board ps Waverley as she sails to Lochranza on the Isle of Arran. These events are always popular and have recently been revised to include a Welcome audio visual presentation by our Branch Chairman in the ship's Lower Bar after which members can relax and chat over a cup of complimentary tea of coffee before visiting the ship's Engine Room and Bridge areas. The flyer above (click on image to enlarge) gives more details but suffice to say that this is an ideal introduction to the Branch - so join on or before Sunday and come along!! 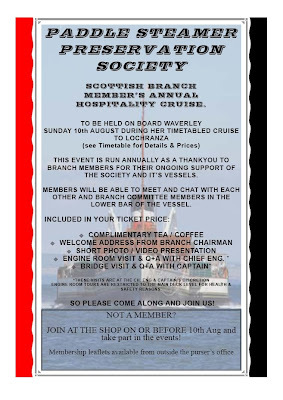 Whilst there is no charge for the actual Branch event you must purchase a cruise ticket from either the Waverley Excursions Website, by phoning 0845 130 4647 or from the Ship's Purser on the day. Proceedings will begin just after the ship has sailed through the Narrows (Kyles of Bute) and will come to a close to allow members to view the approach to Lochranza Pier so if you want to come along make sure you join the ship at or before Rothesay -the timetable can be found here. Fancy it ? We'll see you on Sunday then!!! Click Below To Find Waverley Today! The Paddle Steamer Preservation Society (PSPS) is Britain's longest established, largest and most successful steamship preservation group. A registered charity founded in 1959, we have over 3000 members and through our associated charitable companies we operate the only two working paddle steamers in Great Britain. Without the PSPS there would no longer be the opportunity to sail on a Paddle Steamer in Great Britain. iii) to acquire, preserve and exhibit a collection of equipment and material associated with paddle steamers. Flagship of our fleet is Waverley the last sea-going paddle steamer in the world. Built in 1947 Waverley was gifted to the Society for just £1. As well as operating on her native Clyde each summer she visits other coastal areas around the UK during the spring and autumn each year. Kingswear Castle is Britain's only operational coal-fired paddle steamer. Built in 1924 to sail on the River Dart she was purchased by the Society in 1967. From 1985 until 2012 she sailed the Thames and Medway. In 2013 Kingswear Castle returned to the Dart where she now operates public sailings during the summer season. The society is composed of five branches: Scottish, London & Home Counties, Bristol Channel, Wessex & Dart and North England - all of which help raise money to keep our paddle steamers sailing. The Scottish Branch was formed in 1969 by Douglas McGowan, now our Honorary Branch President. In November 1973 Douglas was invited to attend a meeting with CalMac which resulted in Paddle Steamer Waverley being gifted to the PSPS for £1! It was then on 8th August 1974 that the PSPS took ownership of the last sea-going paddle steamer in the world and her second career in preservation had begun. Since 1974 the Scottish Branch has been directly linked to supporting Waverley. The Scottish Branch is proud of its achievements. We are an active and forward thinking branch with a thriving membership of over 800 - we are proud to be the branch which secured an operational future for Waverley. Our members are regularly involved with voluntary work which helps ensure Waverley continues to sail. During the summer sailing season we help raise funds through the Society's Grand Draw and our annual fundraising cruise on Waverley. The Branch meets in Glasgow each month during the non-sailing season (October - April) and we extend an invitation to join the Society and indeed join the Scottish Branch.